Regular readers of this blog know that noise (interference, to be correct) from various sources is my most prominent nuisance. A few weeks ago, I stayed for a weekend on a rural location in France and took my IC706 and antenna with me. A wire antenna was put up, using a tall tree and two fishing rods to support it. Although it was not particularly high up, it worked well. On 60 metres, transmitting is not (yet) allowed in France, but I was most curious to find out about the background noise level. Well, it was astonishing. I estimate the difference with the home situation to be at least 15 dB. I had to use an attenuator of 20 dB at home to get the same background noise level as in France. Allowing some dB’s for the less effective antenna in France, the 15 dB estimate should not be too far from the truth. According to the CCIR noise reports, a background noise level of nearly 40 dB above the thermal noise can be expected in a quiet environment. At home, it is measured at about 60 dB! Note that this is a level for median business environments. 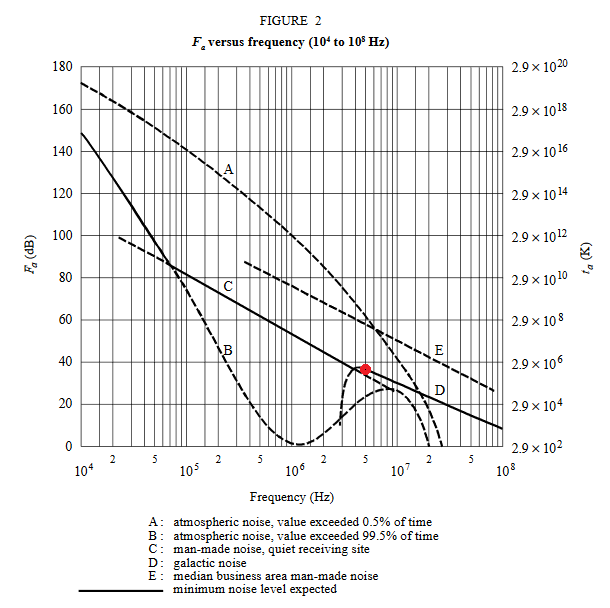 The chart below (taken form the report mentioned above) shows the minimum expected noise level, 5 MHz is marked with a red dot. In France, the noise level is not far from the CCIR predicted levels and it illustrates that the EM pollution at home is severe. In many cases, amateurs report even worse situations and the simple conclusion is that if nothing is done, wireless systems will suffer from ever increasing and severe degradation. 15 dB corresponds to roughly 40 times the power level and this implies that transmitters consume far more energy than necessary. Of course, receiving weak signals is impossible for many stations, unless you live in a quiet rural area. To all politicians: stop talking B**lsh*t and stop being the gofer for the industry. Shame on you. (4) Member States should be responsible for ensuring that radiocommunications, including radio broadcast reception and the amateur radio service operating in accordance with International Telecommunication Union (ITU) radio regulations, electrical supply networks and telecommunications networks, as well as equipment connected thereto, are protected against electromagnetic disturbance. May I remind you of this obligation?